So you have always wanted to open your own bagel business, but how much do you know about starting such a business? While a passion for bagels and other breakfast foods is great, there is a lot more than goes into owning a business. First, you need to make sure that you have the right skills, experience and personality for the job. Have you owned a business before or helped manage one? Do you have any business education? Do you thrive under high stress situations and like dealing with people, both staff and customers, on a daily basis? Be honest with yourself about what kind of environment you thrive most in. An Introduction that includes a description of the business in which you highlight the products and services you will provide, a description of the marketplace you will be operating, as well as any risks or challenges you anticipate. There should also be a section where you lay out all the key management roles you will need in your bagel business. If you already know who will fill these roles, then include a little bio of each of them and/or a resume which highlights their experience related to the running of a business. A marketing section is also important. Here is where you will lay out the competitive advantages your bagel business will have as well as give as much of a sense as possible of what your marketing and advertising strategies will be. You should also include Pro Forma Financial Projections which basically means any income statements, cash flow statements that are relevant to the business as well as balance sheets that project what the financial performance of the business will be once it open. Always make sure your estimates are on the conservative side because you don’t know what kind of delays or obstacles you will face, especially that first year. Even if you are funding this whole venture out of your own pocket, in your business plan you should still meticulous list all your startup costs including the money you will need to survive on until your bagel business starts turning a profit. Don’t forget to factor in a budget for marketing and advertising and leave yourself a little cushion for lean times or unexpected emergencies or repairs. While you are putting together your bagel shop business plan, figure out your target market for a bagel business. Bagels have become a popular breakfast staple so your customers will probably come from all walks of life. You need to also consider your growth potential for opening a bagel shop. Luckily, customer cravings for bagels and other breakfast treats don’t show any signs of slowing down. For extra protection, you should consider forming a legal entity. Doing this prevents you from being personally liable if your bagel business is ever sued. The heart and soul of your bagel business is of course is delicious bagels. It is important to not rush this part of the process. Make sure you have tested your recipes thoroughly before greenlighting your business. Make sure you have filled out all legal and financial documents that are important to protecting your business. In addition, make sure you have all necessary licenses and permits to run your shop. The location of your shop is also very important. You want there to be good foot traffic and ample parking spaces. Work with an experienced realtor to find the perfect spot. As you finally open your doors, establishing a strong brand for yourself is going to be a key ingredient to the success of your bagel business. Grow your brand through customer interaction as well as advertising and marketing. A well-designed website and a strong social media presence are also important too. Another business option that you might not have considered before is to go the franchise route. Instead of opening an original bagel business that you have to create from scratch, join a bagel franchise like Shmagel’s Bagels and benefit from their brand power and support structure and experience in the business. 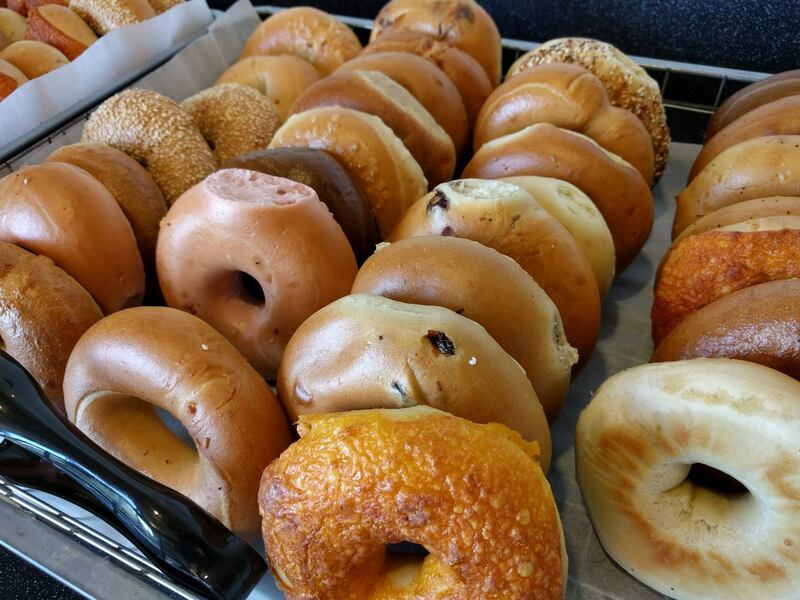 At Shmagel’s Bagels, their specialty is fresh bagel creations baked daily. Right now they have two locations in Ocean City, MD and are looking to expand. They have plenty of franchising opportunities and will work closely with you to make sure your locations are a success. At Shmagel’s Bagels, the bagels are baked fresh every morning. They also offer a variety of cream cheeses and other popular bagel toppings, shmuffins as well as some fun sandwich options like a Turkey Jack Melt bagelnini or a Bagel Grill Cheese. The menu offers enough variety to please all your customers, but is still manageable for you and your staff. One must-have ingredient for any prospective Shmagel’s Bagel franchisee is to have a passion for breakfast. Can you eat breakfast all day long? Do you enjoy making people happy by offering them a fulfilling breakfast to fuel their day? Shmagel’s Bakery has been growing in leaps and bounds. Every year, more and more Americans are choosing bagels as not only their top breakfast food, but their top treat all day. Want to learn more about Shmagel’s Bakery and how to start a bagel business, give them a call today or visit their website. Click above or call 410-824-1152 for more information. Visit one of our two locations – See Locations.